The Old Time Moonshine (OTM) Project came out of a desire to preserve this most unique strain. 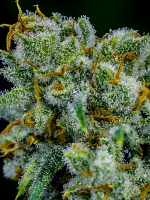 Old Time Moonshine Regular Cannabis Seeds by Mosca Seeds: The Old Time Moonshine (OTM) Project came out of a desire to preserve this most unique strain. Originally created by DJ Short, the OTM line is full of unique mutations not found in any other strain. 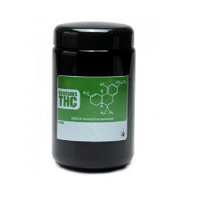 A true Hashplant, selected for its outstanding production of large, clear gland heads. This mostly indica hybrid really packs a musky/fruity punch with a medium height producing large, dense buds glistening with trichomes. She is more musky than fruity with a burgundy/earthen flavour at cure. Mosca Seeds has taken a perfect specimen of a male who is very sativa leaning with dark green leathery leaves and hit exclusive clone only strains to create a plethora of new keeper plants. The OTM project has is one of the most anticipated projects Mosca Seeds has ever released! Please enjoy the fruits of Mosca's labour of Love. Growers refer to the Old Time Moonshine aroma as “Blueberry Muffin Tops”.